"I made a few changes to a recipe on the back of a canister of oats. Now this is the only one I use. I often use hazelnuts in place of the pecans, and they are just as good. I hope you enjoy them as much as we do. You can make these larger or smaller; simply adjust the baking time. Keep loosely covered, and they will maintain their chewiness for several days, if they last that long." Preheat oven to 350 degrees F (175 degrees C). Place an oven rack in the upper third of the oven. Line baking sheets with parchment paper. Place unsalted butter and light brown sugar into the work bowl of a stand mixer and mix on medium-slow speed until very fluffy, 3 to 4 minutes. Beat in the vanilla extract, followed by eggs, one at a time. Reduce mixer speed to lowest speed and leave running. In a separate bowl, whisk together the rolled oats, flour, baking powder, cinnamon, kosher salt, and nutmeg. Pour the dry ingredients into the slowly running mixer in thirds; mix in dried cranberries and nuts until just incorporated. Using a large cookie scoop, place dough on prepared baking sheet about 2 inches apart. Bake one batch at a time in the preheated oven just until the edges are brown, 17 to 18 minutes. Allow to cool on baking sheets for about 5 minutes before removing to finish cooling on wire racks. Way too salty!!! Cut down on that. Delicious! 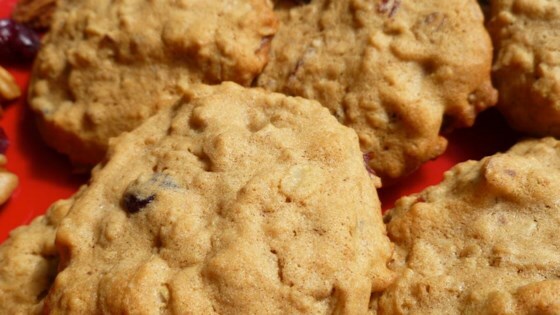 If you like a cookie that's crunchy outside and chewy inside, these will make you happy. Cranberries and pecans are an awesome combination. These are my new favorite cookies. They're soft and chewy and freeze well.